Great cover photo shot at The Briarwood Lounge in Mt. Healthy, (Cincinnati) Ohio probably in the 80s. This is one of the newer Jewel Records I've found. 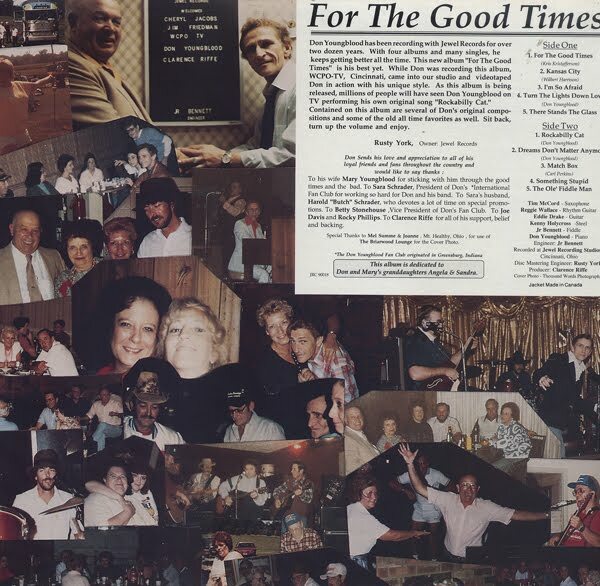 Rusty York (Owner, Jewel Records) wrote the jacket notes. Apparently WCPO (Cincinnati, TV Station) shot Youngblood recording this LP, according the the notes and York mentions this. 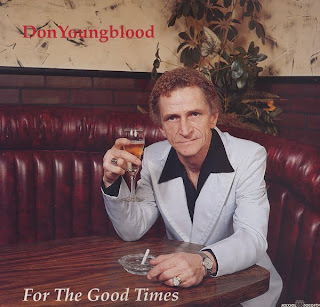 Youngblood thanks the president of his "international fan club", The Don Youngblood Fan Club originated in Greensburg, Indiana. But, today, I can find nothing about Youngblood online. Straight out of the sealed shrink wrap, Something Stupid. As always, if there is a problem with any post, let me know and I will attempt to make corrections. 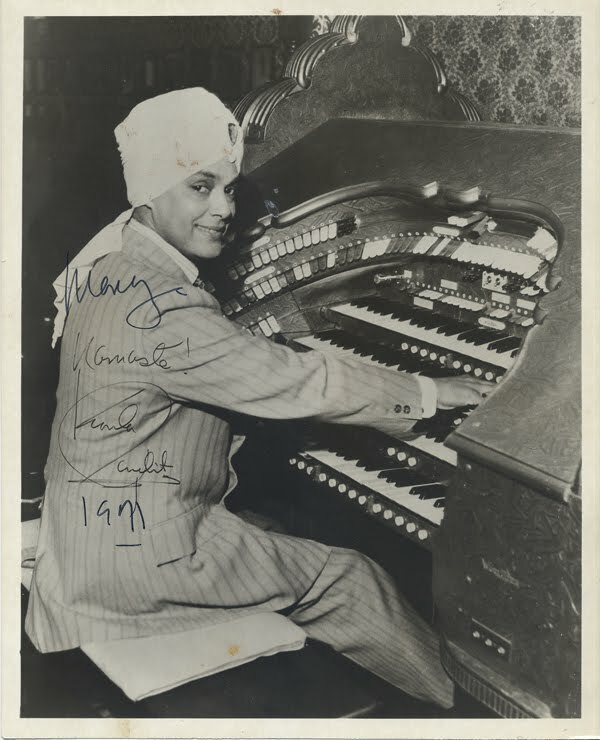 I picked up another copy of Korla Pandit - The Universal Language Of Music - Volume 3. With this copy came with an autographed 8 x 10 glossy press photo of Pandit! Many collectors of exotica refer to Pandit as The Godfather of Exotica. 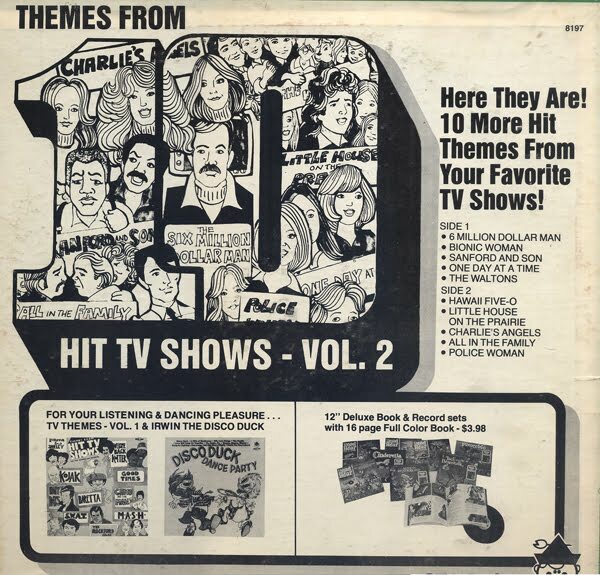 Universal Language Of Music was released in 1969. By 1971 Pandit had recorded at least another 4 LPs under his belt. I'll take one cup of Gould Brand Easy Listening, thank you. This offering has just enough exotica touches to keep your interest. I prefer the flavor of the B side over the A side. 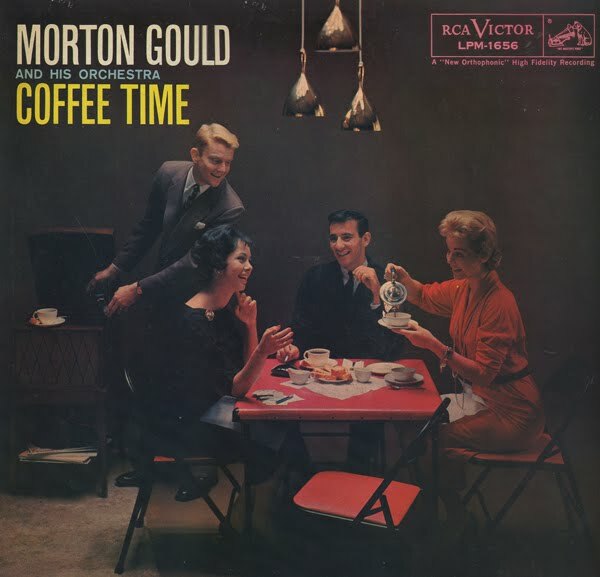 Another fine Gould space age cover. Cream and sugar? Somerset strikes again with groovy budget cover image of a woman... or man... hard to tell. Easy listening covers of "hits" by a group of studio musicians, who call themselves The Academy Award Orchestra for this project. 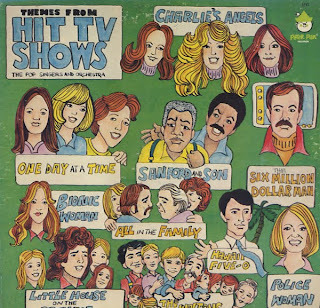 Imagine finding this garish looking Peter Pan album and noting the song covers are attributed to The Marty Gold Orchestra. 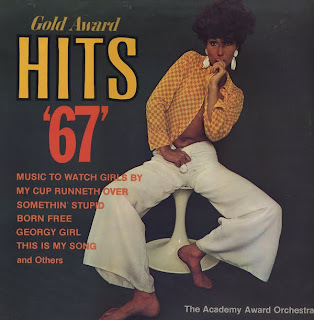 Gold is known for a number of "space age" pop albums, including Skin Tight which is very good and somewhat collectible. The Theme from The Deep is a stand out. 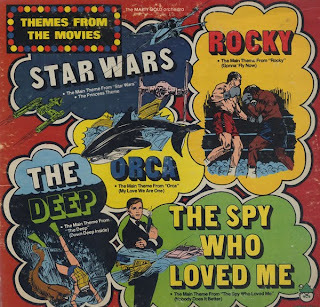 The (Star Wars) Princess and Orca Theme are somewhat exotica and a lot of fun. 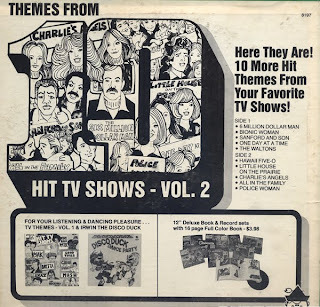 Other tracks aren't stellar pieces, but most have that 70s cheese factor going for them that make up for any possible let down. 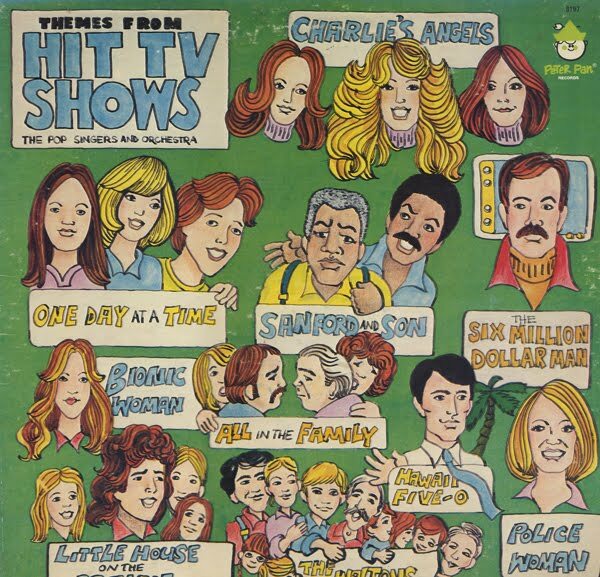 Great 70s flavor (cheese flavored) to these Peter Pan covers of hit 70s TV shows by the mysterious Pop Singers and Orchestra. The Police Woman cover is also excellent. Angie Dickinson as Police Woman. I almost forgot about that show! This record is a reissue of Roulette SR-25032 that was released 1958. Billboard Magazine review for the original release: Most of the Armenian music in this off-beat platter will sound to the average ear like the musical background for a "kootch" act, with its wailing melodic line, drum and tambourine accents, and Middle Eastern flavor. However George Mardichian lends striking color with his skillful handling of an odd instrument called an "oud", sounding like a cross between a guitar and a zither. Sweet Spring, the first track on the B side is an excellent example of how Mardichian handled the oud. My copy is a bit muddy sounding. I'm not sure if that is due to the quality of my pressing, the reissue or the original recording. Both the Forum and the Roulette release feature the same cover image. This is the cover from the 1955 Liberty mono release. The album was released in stereo in 1960. 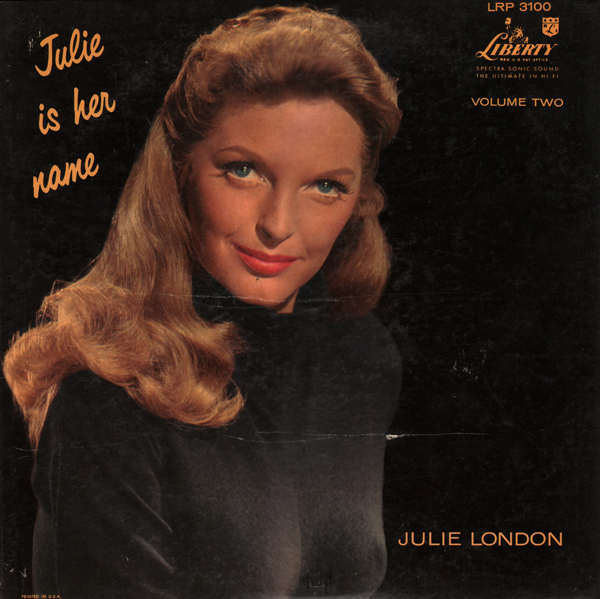 From the back cover: In this, her first album, Julie's molten mezzo is handsomely set off by Barney Kessel's guitar and Ray Leatherwood's bass - a blending of three skills that adds up to an intimate, sleek, and sultry production. A performer who radiates charm and friendliness, Julie is a beautiful, piquant yet unassuming young woman who has flaxen hair, and eyes that are blue. These qualities are vocally evident in her furry singing style. 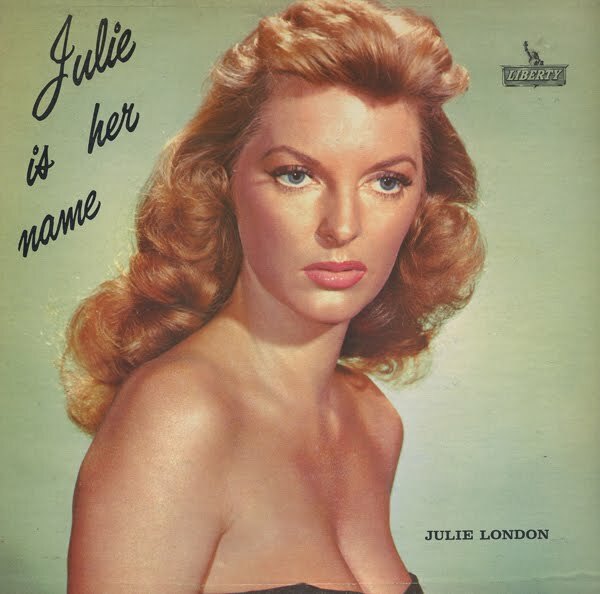 Her choice of numbers is exactly right - ranging from I Love You to Cry Me A River, the latter being a lush, lachrymose item written especially for Julie by her childhood friend, Arthur Hamilton. Cry Me A River, when heard by fellow members off the radio and music fraternity, created an instantaneous and enthusiastic reaction. As a result of this uniform response, Liberty released "Cry" as a single record, catapulting Julie to fame overnight. Small combo consisting of Howard Roberts on guitar and Red Mitchell on bass. Strange and Startling? Not in my opinion. The album is a pleasant and unique folk album that features nice vocal treatments. The question is, who at RKO decided to go with such a strange album cover? From the back cover: The startling and different (to say the least!) cover of this album may quite possibly cause you to quickly catch your breath...and no doubt, do a double-take...but then, when you hear the music that is packaged beneath the "glamorous" photo of our slightly undernourished friend, you'll probaly catch your breath again, for here, you will meet the exciting MICHAEL STRANGE, balladier without peer, and often referred to as the wandering minstrel of the cocktail set. For some twenty years, "Mike" has captivated the gold coast night club audiences in Miami Beach where he makes his home. Now in the third year of his engagement, the Irish folk singer is currently appearing at the smart Black Magic Room where he performs nightly to capacity crowds. With a total of eleven languages at his command (he sings in four, speaks in seven others), Mike has compiled a fantastic repertoire over the years of more than 5,000 songs, some of which date back three centuries and can be traced to practically every corner of the globe. With several network television appearances in addition to weekly guest spots in Miami, the guitar-strumming troubador quickly built a huge and loyal following and "the Strange touch" continues to draw packed houses nightly in the fabulous beach resort. With their first visit to The Black Magic Room, RKO-Unique's talent scouts quickly decided that this unusual entertainer was a talent that should be enjoyed by people everywhere through a showcase of his own. 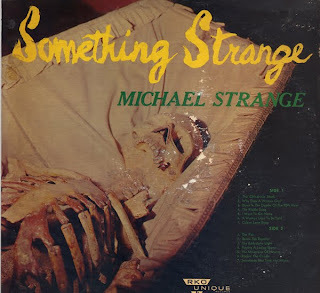 Thus, "SOMETHING STRANGE"...a recorded showcase of folk song fascination. Sit back, relax, listen and enjoy the songs of the handsome balladier in this unique collection.